I’m Philip Downer, and I’ve spent 30 years in retailing. I’m a Director at Front of Store, the retail consultancy that I founded; previously, I have worked as CEO of Borders UK, and before that at Waterstone’s, WH Smith and Our Price Records. I’ve worked extensively in the UK and the US, and I’m now dividing my time between consultancy work and writing/speaking. 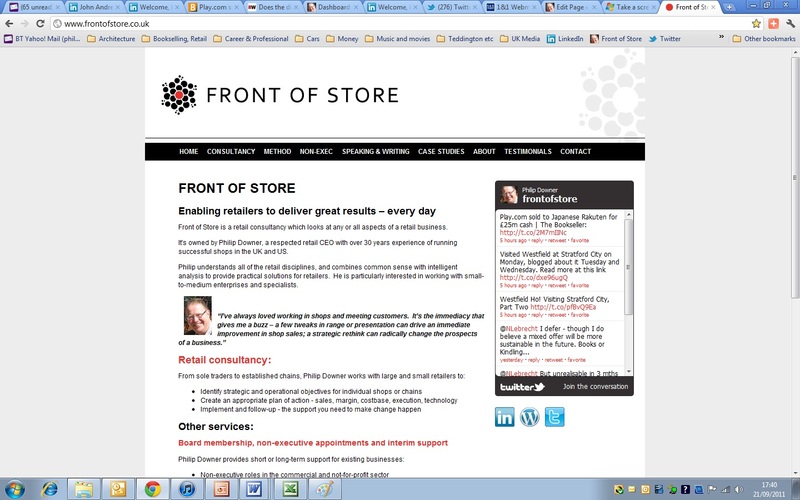 Front of Store provides consultancy support on retail and publishing matters in the UK and overseas. You can read more about Front of Store at the business website, www.frontofstore.co.uk, and you can read a case study describing a recent project at this link: Front of Store case study. I am interested in start-ups, acquisitions, new ventures, and new ideas, and in discussing executive and non-executive roles. I can speak at conferences, seminars etc, and am able to provide an external perspective on retail strategy or operational matters. I also write for publications like The Bookseller and Publishing Perspectives, and am a member of the Publishing Advisory Board at Kingston University. My speech at the Tools of Change conference at the Frankfurt Book Fair was extensively reported – see this link. I also presented at the FutureBook Conference in London in December 2011, and I’m looking forward to speaking again at Tools of Change in New York City in February 2012. You can check out a fuller CV on LinkedIn at: http://uk.linkedin.com/pub/philip-downer/7/a32/bb1. 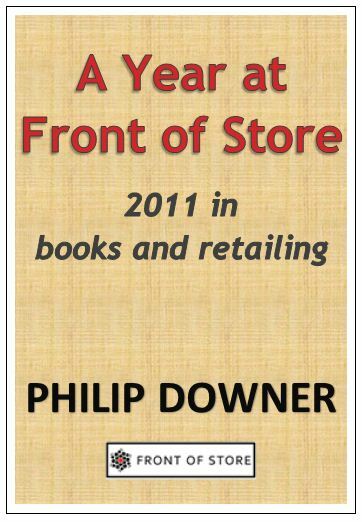 My ebook, “A Year at Front of Store” is available through Amazon’s Kindle Publishing in the following territories: United States, United Kingdom, Germany, France, Italy and Spain. Do treat yourself to a copy! I welcome your comments on the Front of Store blog, which are moderated before they’re published. If you want to contact me directly, you can do so at philip@frontofstore.co.uk. Alternatively, you can find me on Twitter at @frontofstore, and on Facebook at http://www.facebook.com/profile.php?id=1480342820. You can get automatic alerts of Front of Store blogs if you link with me on either of these services. This blog is an opportunity for sharing thinking in a sector that has been revolutionised by the internet and digitisation. It’s also an opportunity to celebrate some of the things that great writing, music and movie-making – and indeed, great shops! – can do for all of us. I found your web site via an image search. I have set up a retial archive on the history of record shops. I thought this might be interest.